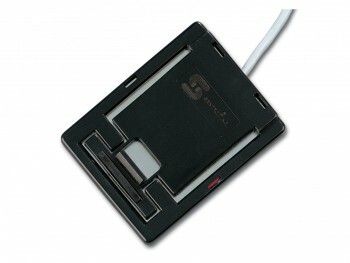 The Bill Trap has been specifically designed for use inside cash drawers. Bills are inserted between the lever and the base plate. Once the bills are removed, contact is made creating an alarm condition. The unit is constructed of Delrin plastic for long life and features a SPDT reed switch for activation. The reed is secured using exclusive polyurethane potting material. Since the unit has no mechanical switch, it is not susceptible to dust or humidity, and is not subject to wear. The device mounts easily using double-sided tape.